The kids and I caught a sneak peak of The Lego Movie 2 - The Second Part over the weekend. The first Lego Movie was a GIANT hit in my house, this one had some BIG shoes to fill. Lego 2 starts as the Duplo's land in Bricksburg and turn it into an apocalyptic wasteland. 5 years later, it looks like a scene from Mad Max ... except Emmet who is still drinking coffee with Planty and singing Everything Is Awesome. At the heart of the movie is play, and how to play with Legos. Finn, the older brother and his sister Bianca have to share the basement Bricksburg at the end of the first movie. Bianca's Legos are brightly colored and covered in glitter and sparkles while Finn is literally in the apocolypse, mixing characters from every Lego set ever. Emmet, Wyldstyle, Batman and the rest of the gang are tyring to prevent "Ourmomageddon" which will end with them in the bin of storage. It was a treat to see Maya Rudolph as the mom. Which means, in this universe, Will Ferrel is married to Maya Rudolph. My kids laughed all the way home on that one. If you thought Everything Is Awesome stuck in your brain like peanut butter, just wait until you hear Catchy Song (This Song’s Gonna Get Stuck Inside Your Head). I have been singing it NON STOP since I heard it. 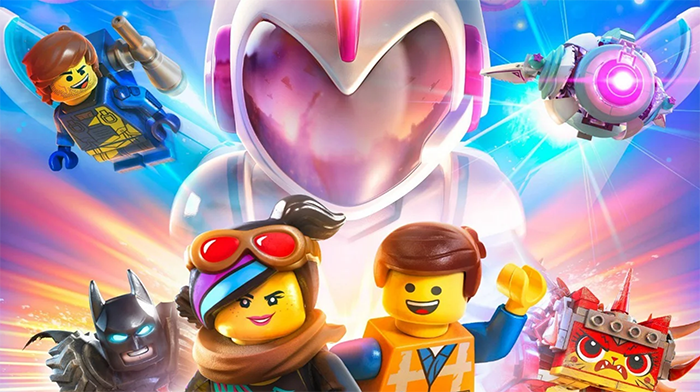 Lego Movie 2 is in theaters February 8. Grab your popcorn, round up the kids and don't miss it!